We offer our clients a gamut of metal spray that encompasses Copper Metal Spray and Brass Spray. Available in bulk quantities, it can be delivered within a short time span and is priced economically to suit the budget of all pockets. Metatech Thermal Spray Pvt. Ltd. is one of the Largest companies in the field of Thermal Spray Zinc Coating in India. Thermal Spray Zinc Coating is very useful for protection against corrosion. 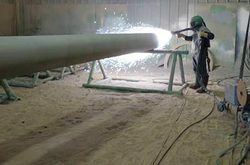 Thermal Spray Zinc Coating is also applicable for pipelines sufuring from heavy corrosion. Our organization hold expertise in providing superior grade Copper Spray MetalizingServices to our precious customers. The offered range of reactors is manufactured by our vendors using high quality raw material and components. Clients can avail offered range of instruments from us at competitive prices. 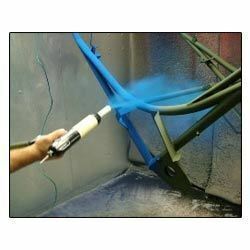 To meet the varying desires of our clients, we are engrossed in providing highly reliable Spray Coating Job Work. Trained under the command of capable personnel, these services are broadly recommended. In addition to this, our services are offered at market leading rates. Metal spray samples to test colour accuracy of both water-based and conventional paint with a black stripe to indicate the degree of the colours’ opaqueness and a 15 mm hole to match the colour. Taking the advantage of our offered finest grade Metal Spraying Service, we have become the preferred entity in the industry. These services are specially rendered for very fine material and trusted widely to attain a smooth finish. We are expert in rendering surface treatment services and offering the top rated services for removal of carbon or paint from aluminum surface.